There was a point last night during the 2nd half that Gareth Bale and Aaron Ramsey were gently exchanging 5 yard passes with each other on half way, and not one Russian player could be in the least bit bothered to stop them. 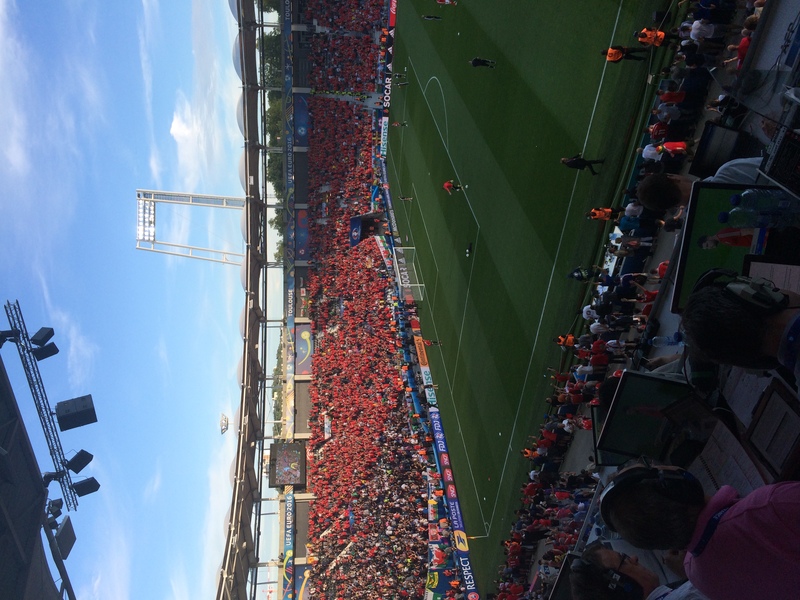 It was just one of many extraordinary sights I witnessed from our commentary position in Toulouse as Wales sailed through to top Group B on a glorious clear evening where the vanilla sky above was as clear as Gareth Bale's route to goal and the Russian flag might as well have been a white cross on a white background. Just as striking a moment was when Russia brought off skipper Serhiy Ignasevich midway through the 2nd half and the captain's armband suddenly became as toxic as Carbon 14 to several players who showed absolutely no interest in stepping up to represent for their country. I was open mouthed in commentary watching that, never mind what the remaining Russian supporters made of it away to my right. They must've been utterly embarrassed by the lack of heart and fight shown up by their countrymen in that one moment. Even Akinfeev who eventually took the armband looked irritated to have to wear it. Blimey. Once the team sheets came in an hour before kick off, I took the liberty of calling my broadcasting colleague John Bradley, a man who specialises in Russian football in particular, just to get his thoughts on the 4 changes the side had made and how Wales could exploit them. John was quick to point out to me that Glushakov & Mamaev, whilst being deployed in defensive midfield positions, were not known for being defensively minded. It was as though Slutsky had decided to go for it, especially as Neustätder had been so ineffective there in the first 2 games and without having Denisov or Dzagoev in the squad at all, Russia looked threadbare in central areas. Every Welsh player did his job quite brilliantly. James Chester may not be in the West Brom team every week, but as one of the 3 centre halves, he looked assured and dominant (I also noticed that of both McAuley and Johnny Evans of Northern Ireland/WBA...props to another Welshman Tony Pulis for their defensive development for certain). Bale had far more touches of the ball than in the first games and Sam Vokes was an ideal foil up front - as soon as he won his first aerial battle in the first minute, you could see how Wales were going to cause problems. Danny Gabbidon alongside me even started to relax at 3-0 - he wasn't too nervous beforehand to be fair, and he could barely believe it was him who screamed at the top of his lungs when I later played him our talkSPORT commentary on Ramsey's opener. He's got a roar on him, that boy. We booked possibly the worst Uber driver to take us round the Wrekin (one for the Midlanders there) back to Centre Ville, which was quiet, save for some Welsh stragglers walking the streets in happy disbelief at what they'd witnessed. I got the same vibe from all the ex-Welsh internationals who gathered post-match in the media centre to sup a watered-down Carlsberg or two. Messrs Savage, Hartson, Roberts, Gabbidon, Tudor-Jones and Ratcliffe were all rightly back-slapping, laughing and tweeting. I think after all the near misses that they've been collectively involved with over the years for Wales, you most definitely forgive them for almost living their lives vicariously through these 23 fellas now with the dragon on their chest. Goodness knows I would if I was in their position! Not a trace of bitterness or jealousy - just sheer unbridled joy at what they're witnessing here. "Don't take me home" is the song they've all been singing in the stands to the tune of 'Achy Breaky Heart' - there's no broken hearts here...just hearts full to bursting with pride. No need to worry about trips home for another week yet.